FOXBOROUGH, Mass. -- Denna Laing, a member of the Boston Pride professional women's hockey team, remains hospitalized after crashing into the boards in the first period of Thursday's Outdoor Women's Classic at Gillette Stadium. Laing remained on the ice against the boards behind the goal for several minutes while trainers rushed to help her. She was taken to Massachusetts General Hospital. 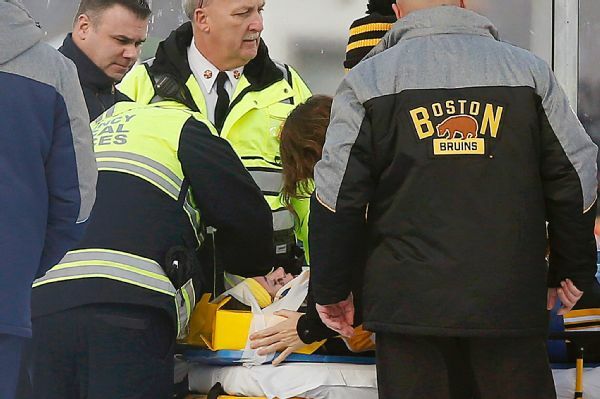 Denna Laing, a member of the Boston Pride professional women's hockey team, was taken off the ice on a stretcher and hospitalized after crashing into the boards during the Outdoor Women's Classic at Gillette Stadium. Boston Pride coach Bobby Jay told the Boston Globe that Laing's parents were with her at the hospital. "Obviously, all our team was concerned, as was the Montreal team," Jay told the Globe. "We're thankful we're in Boston and she's getting great care. We're confident that she'll be fine." Jay downplayed ice conditions as a factor in the injury. "I don't think the ice was an issue at all," he said. "It was just a hockey play, going into the corner. She stepped on a stick and just lost her footing a little." The National Women's Hockey League released a statement confirming Laing was hospitalized, but further information would not be available Thursday night. Laing, from Marblehead, Massachusetts, is a 24-year-old forward who played at Princeton. The Pride were playing the Montreal Canadiennes in an exhibition at the home of the New England Patriots. The game ended in a 1-1 tie after two periods. The NHL's outdoor game between the Bruins and Canadiens will be held Friday.